Features: Lap the competition with truly next-generation features. Experience uncompromising physics simulation. Master real-world tracks from around the globe. Collect, upgrade and tune hundreds of cars. Create and share your masterpiece with the world. 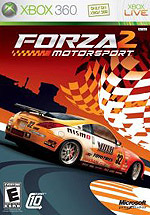 Description: Forza Motorsport 2, the sequel to Microsoft Game Studios' award-winning, fully customizable driving simulator Forza Motorsport, speeds its way onto Xbox 360 this holiday. With authentic simulation physics, bone-jarring damage, photo-realistic graphics, and licensed tuning and customization options, the franchise improves on the unprecedented features gamers enjoyed in its debut installment. Loaded with more than 300 of the world's hottest cars for you to collect, personalize and tune, Forza Motorsport 2 gives you a complete racing experience. Verdict: In all honesty, I believe this game may be one of the most misunderstood games to be reviewed by both the players and online reviewers (IGN)! I am about 8 hours into playtime and it is definitely the best racer I ever experienced. I have never played any GT games, but I played most other famous racers like the Burnouts, PGR2 and 3 and NFS. I would like to address some perceptions to help the potential buyer make an informed decision. Sensation of Speed - Give the game time to build up your collection of cars. Once you are awarded the high-end cars, the sensation of speed is undeniable, especially at 60 frames per second. One can't really compare this game to the Burnout titles which give a totally different and arcade-like feel. Graphics - There are complaints out there that the game has "jaggies". I just don't see them. The graphics and especially the modeling of the cars are the best I have seen in a racer with not a single frame-drop ever. I do have an HD set and perhaps the game doesn't look good on a 480i set. I couldn't tell you. Sound -Although the music is B- rated at best, the sound where it counts, in the cars and ambient sound, is excellent. Tracks - This is where I agree with most in my clique that the variety of tracks is definitely lacking. Also, the tracks are quite plain. That may be the sacrifice the design yields from sticking to 60 FPS. Wheel misperception -Unless you have been racing with a wheel or don't have much experience with racing games using a dual stick controller, I DON'T recommend getting one. I have been playing racing games with a dual stick controller for a long time. I thought too that getting a wheel would improve my experience. I bought a good quality wheel and had to return it because the paradigm shift was too great. Keep in mind all the nuances that your fingers are used to in adjusting the dual stick controllers and triggers for gas and brake. These movements now have to be translated to a wheel and your feet. I winded up returning the wheel because I couldn't keep any car under control and I realized it wasn't the wheel's fault, it was my inability to translate from the sticks to the wheel. Again, that is just me. Difficulty - Again some people think it is too hard or too easy. I just don't see it. This title has an unprecedented amount of difficulty settings from any video game, not just racers. One has to spend the time to see the many different options available to adjust difficulty from almost arcade-like to extremely difficult with many increments in between those settings. In closing, this is a superb quality title and I highly recommend experiencing it.